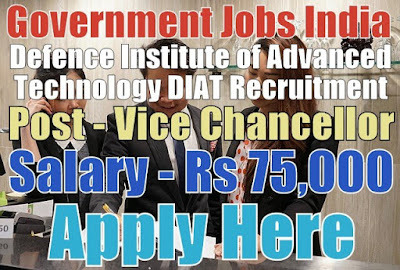 Defence Institute of Advanced Technology DIAT recruitment 2017-18 (Ministry of Defence) notification for 01 vice chancellor post. All legible and interested candidates can apply on or before (03-06-2017). 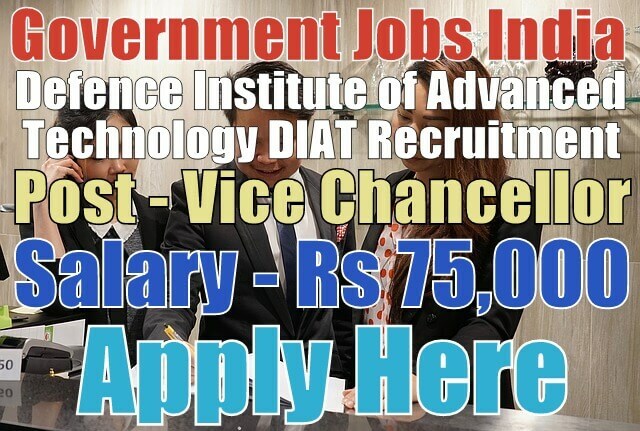 Further information about the Defence Institute of Advanced Technology courses and exams, careers, salary details, DIAT Pune vacancy, application fee, educational qualifications and all other details/information about this post is mentioned in details below. Name of Vacancies and Number of Posts - The name and number of posts are mentioned below. 01. Vice Chancellor - 01. Salary/Pay and Grade Pay - For vice chancellor post, the payable salary will be Rs 75,000 with Rs 5,000 grade pay. Further information about salary details is mentioned in the detailed advertisement. Age Limit - For DIAT recruitment, candidate age should be less than 56 years. To know more about age details, click on the detailed advertisement. Educational Qualifications - Candidates have must done 10th (matriculation), 12th, a graduate degree, post graduate degree or it's equivalent/relevant/higher qualification from a recognized board or university. To know more about educational qualification details, see the advertisement. If you are not graduated then, click here for 10th and 12th based jobs. Work Experience - Candidates must have 10 years of experience as a professor in a university system or 10 years of experience in an equivalent position in a reputed research and academic administrative organization. For more information about work experience required for this post, go through the detailed advertisement. How to Apply - All legible and interested candidates have to download an application form from official website https://rac.gov.in/ or from the given link below. Application Fee - There will be no application fee for any category candidates. Regular employees of DIAT applying for the higher position are too not required to pay any application fee.